The Reno OPPO series has finally become official. During an event in China the manufacturer announced the Reno 10x Zoom , packed with cutting-edge specifications as a triple 48-megapixel camera with 10x hybrid zoom support. It also announced a “standard” version of the same device, an intermediate smartphone based on the Snapdragon 710 processor. After some leaks, Oppo has finally announced the Reno, its newest smartphone that arrives to be the flagship device of the Chinese brand. This is the company’s first device with truly premium specifications since the Find X , launched last year. It comes equipped with Snapdragon 855 chipset, a 48 megapixel camera and a 10x optical zoom lens. And, of course, without notch. Its main highlights are the retractable camera in the form of a slice of pizza or a shark’s fin and with 10-times optical zoom, which was exhibited at the Mobile World Congress. To make this design possible, Oppo had to install a somewhat different pop-up style selfie camera. While in Find X it was necessary to lift the entire top panel of the phone whenever you needed to unlock it or take a selfie, on the Reno there is a ramp-shaped part that houses the front camera and the flash. This design option prevented the company from adopting a biometric security system such as FaceID, so instead the Reno has a fingerprint scanner under the display. 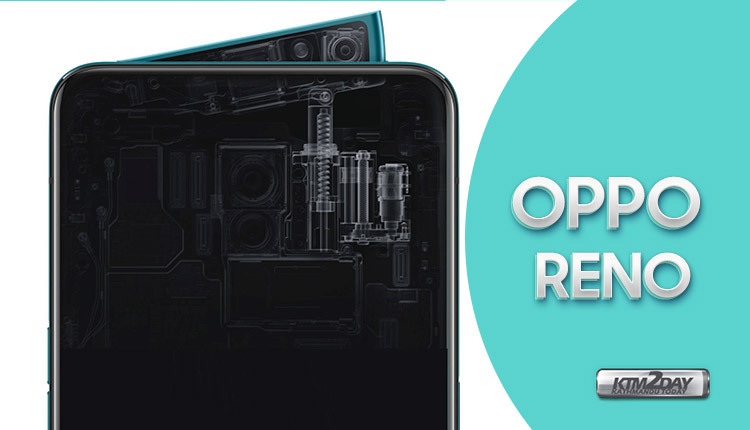 The body of the OPPO Reno 10x Zoom is made with a 7000 series aluminum alloy frame. It masures at 16.2 x 7.72 cm, 9.3 mm thick and weighs 210 grams. The 6.65-inch AMOLED screen has FHD + resolution (2340×1080 pixels) and does not have any kind of notch or holes, which results in a 91% aspect ratio between the front of the device and the screen. The screen is also HDR10 + certified and incorporates a sixth generation fingerprint reader. All of this is protected by a Gorilla Glass 6 panel. Under the hood of the Reno 10X Zoom, you can find a Snapdragon 855 with 8 GB of RAM and up to 256 GB of internal memory, expandable through microSD cards. 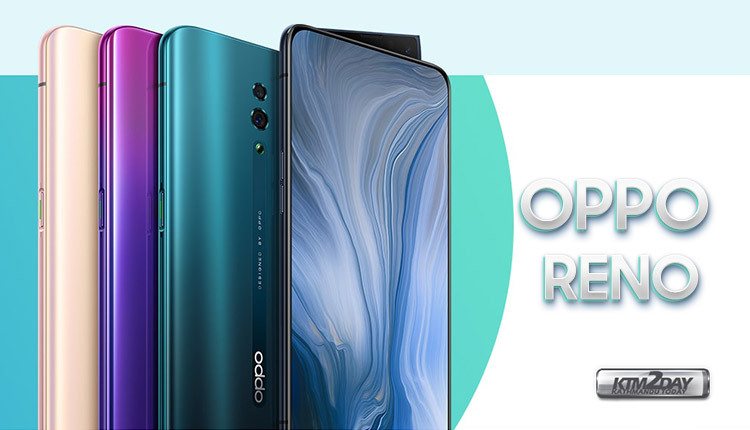 The 4065 mAh battery supports fast charging in the VOOC 3.0 standard and, with regard to heat dissipation, the OPPO Reno 10x Zoom is equipped with a liquid cooling system. The smartphone also features a 16MP front camera with LED flash mounted on a pop-up module reminiscent of a uniquely designed shark’s fin. 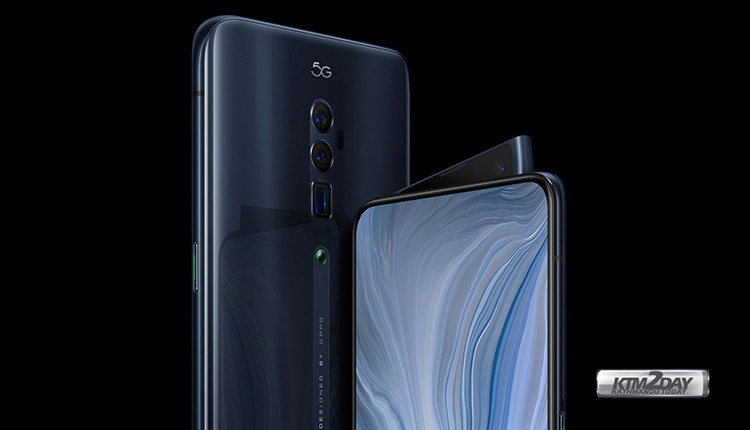 On the back, OPPO has chosen to use a triple camera configuration that includes a 48-megapixel Sony IMX586 main sensor, an 8-megapixel secondary sensor and a 13-megapixel “periscope” (as in Huawei P30 Pro) equipped with optical zoom (as in Huawei P30 Pro) and optical image stabilization. There is also a dual LED flash and laser autofocus. There will also be a dual OIS technology. The camera will be able to take intelligent portrait photos, as well as enhanced colour correction for lifelike skin tones. The camera will also have an Ultra Clear Night View 2.0 mode for better low light photography. The Reno comes in two versions: the Reno standard version and the Reno 10x Zoom Edition. The first has a 6.4-inch OLED screen, a Snapdragon 710 SoC and an ultrawide dual camera; while the second comes with a 6.6-inch screen, Snapdragon 855, and a triple camera with 10x zoom. Both phones include Fast Charging NFC and VOOC 3.0. The standard version of the OPPO Reno has a Snapdragon 710 processor, also accompanied by 6 or 8GB of RAM and 128GB or 256GB of internal expandable memory, and a dual configuration for the rear camera with 48 megapixel + 5MP sensors with OIS . It also features a 16-megapixel front-facing pop-up camera with LED flash, a 6.4-inch AMOLED screen and a 3.765 mAh battery with VOOC 3.0 fast charge. 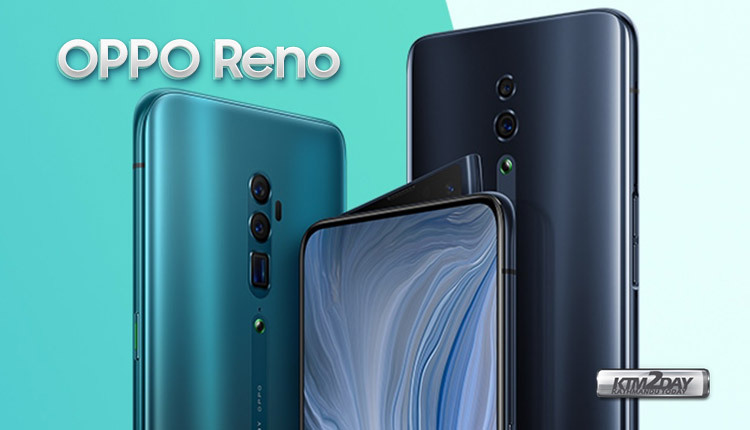 Reno’s standard model comes in three different versions: the first comes at roughly $ 450 and comes with 6GB of RAM and 128GB of storage; the second costs $ 490 and comes with 6 GB of RAM and 256 GB of storage; and the latter comes out at $ 540 with 8 GB of RAM and 256 GB of storage. The 10x Zoom Edition, meanwhile, has a higher price: $ 600 for the 6 GB version of RAM with 128 GB of storage; $ 670 for the variant with 6 GB of RAM and 256 GB of storage; and $ 710 in the top-of-the-line version with 8 GB of RAM and 256 GB of storage. A 5G-ready variant of the Oppo Reno 10x Zoom Edition was also teased at the launch event, though its development is slated to kick off next month. 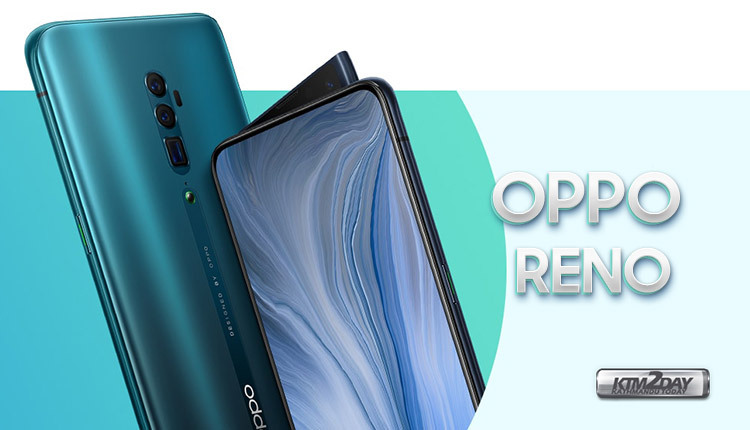 Oppo hasn’t revealed the global launch schedule of the Oppo Reno smartphone variants. However, an event is taking place in Zurich, Switzerland on April 24 where the new models are likely to get the global price and availability details.